Women Create was an intensive 6-week project that included a juried exhibit, salons, workshops, an art market, and the creation of a new collaborative installation. All of the activities related to this project were coordinated by Debra Eck and me. 115 East Third Street, Jamestown, NY. Each of the three salons was held in the gallery on a Wednesday evening. 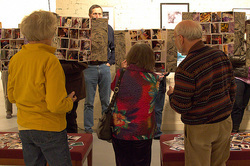 Three or four of the featured artists gathered to talk about their work. The public was invited to attend. The presentations were short, but very informative and though provoking. The setting was informal. Between presentations, guests were encouraged to look again at the artwork and enjoy refreshments. 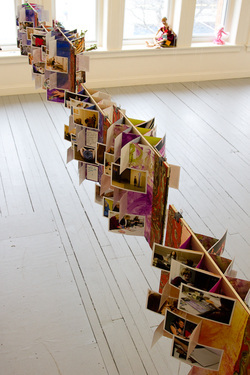 The installation is a collection of 16 hand-made flag books created through the efforts of several women at three free workshops offered by artist Debra Eck. Two of the workshops were hosted by the Infinity Visual and Performing Arts Center at 116 East Third Street in Jamestown, NY, across the street from the 3rd on 3rd Gallery. These two workshops involved preparing the papers with a paint wash and constructing the flag books. In the meantime, throughout the months of January through March, I visited many artist studios and photographed women being creative. I made thousands of photographs and wrote about the artists on the Women Create blog. Selected images were printed for use in the installation. The final workshop took place in the Gallery and involved affixing my photographs, as well as photographs submitted from others in the community, into the flag books. Each book contains 12 images of girls and women creating something, as well as cards containing quotes about the creative process. The installation was officially unveiled at the closing reception of the Women Create exhibit on March 31, 2012. The collection was also displayed at the Cattaraugus County Arts Council Art on Main Gallery in May 2012. The books are now available for display elsewhere. If you are interested, please use the Contact Me form. This portion of the project was funded in part by the Ray and Wyn Ritchie Evans Foundation Artists in the Community Grant administered by the Cattaraugus County Arts Council. Women Create culminated with a celebration of SWAN Day, Support Women Artists Now. Celebrated in 2012 on March 31st, the Jamestown event included workshops, a lunchtime lecture, and the closing reception for the exhibit during which the photo flag book installation was officially unveiled.